High resolution Moon photography is done with two telescopes: a Celestron 14" and a high quality 10"f/15 ‘planetary’ Schmidt-Cassegrain with 25% obstruction. Before starting a webcam session, collimation is always checked. It has to be perfect. Depending on seeing conditions, different barlows are used, ranging between 1,8x and 4x. A dispersion corrector is a great help to obtain the smallest lunar features, especially when the Moon is close to the horizon. Also helpful are red, infrared and green filters to eliminate the influence of bad seeing conditions. Monitoring careful the sky is a must in our country (Belgium, latitude 51°N). I can use about 1 night in 5 for moon photograpy: 10% of those nights will give high resolution images. 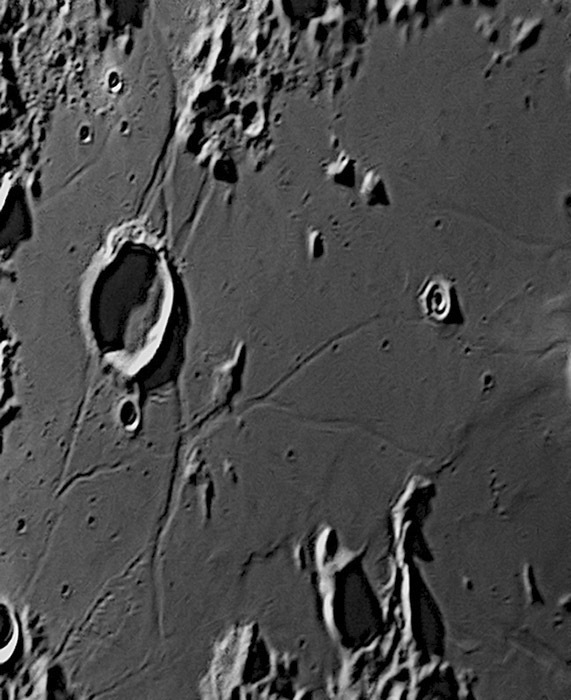 Capturing the Moon is done with CCD-camera’s of Imaging Source: a DMK31AU03 (1024x768 pixels) and a DMK 21AU618 (640x480 pixels). Imaging is done at 60 fps or 30 fps. Webcamfilms consist mostly of 4000-6000 images of which 800-900 are stacked. They are loaded in AutoStakkert 2 for analyzing and stacking purposes. The results are sharpened in Astra Image. When pleased with the results, additional corrections are done in Photo Shop 6. The final touch, denoising if necessary, is done with the free software Neat Image. August 1st 2013 at 3h38 UT. Celestron 14 with 1.8x barlow, dispersion corrector and redfilter. 21st Century Atlas chart 23. This page was last modified on 28 October 2018, at 08:23. This page has been accessed 1,207 times.